So I recently started using my VeganXpress app on my iPhone more to go out to dinner. I found that at Uno’s I could eat many things but at Applebee’s I could eat pretty much nothing (they have both meat and dairy in almost everything even their veggie sides and salads). Last year Uno’s had a Farro Salad I loved on their small bites/apps menu. They have since changed it and added dairy and a bunch of other stuff that overcomplicates it but you can get the original one as a side order and double it. I was in love with it and decided to start making it at home and serving it with tortilla chips. My husband actually loves it and I bring it to family events where it is an absolute hit. So I decided to share it with you folks since it is now omnivore approved! The farro can be hard to find but if you bug your local Whole Foods on twitter like I did, when they run out they will hold some for you when it comes back in :). Thanks to Whole Foods in Bedford, MA for that! They will also offer to help you with your vegan skills and show you around. Which I am going to take them up on shortly! I love the Whole Foods people! So you take the farro and cook it. I use a steamer/rice cooker because I have two of them. I am obsessed with this tool and you should invest the $15-25 for one too. It is my favorite kitchen appliance and takes care of veggies and grains without any assistance. Best thing ever! 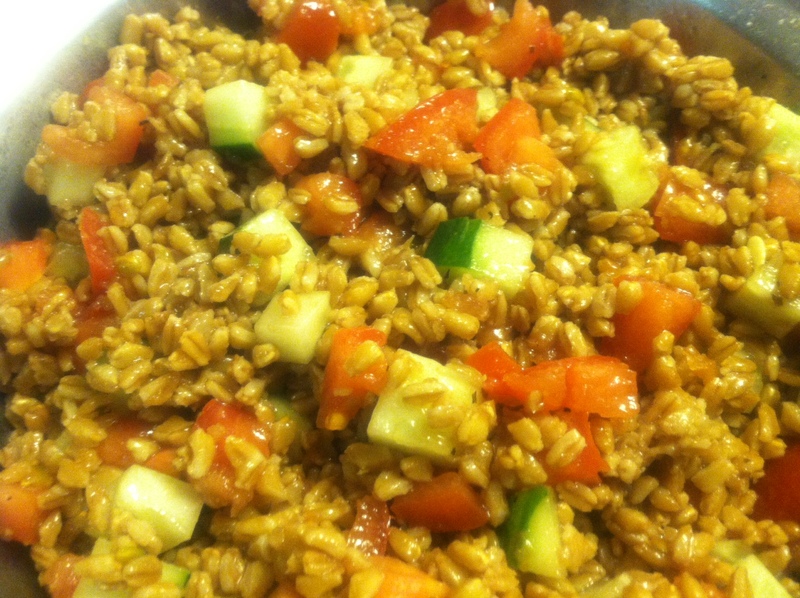 After the farro comes out put it in a mixing bowl and cover it and into the fridge it goes. I have these awesome Royal Prestige mixing bowls that are stainless steel with snap on covers. I would encourage everyone to get something similar. When it is cold, you add the vinaigrette and veggies. 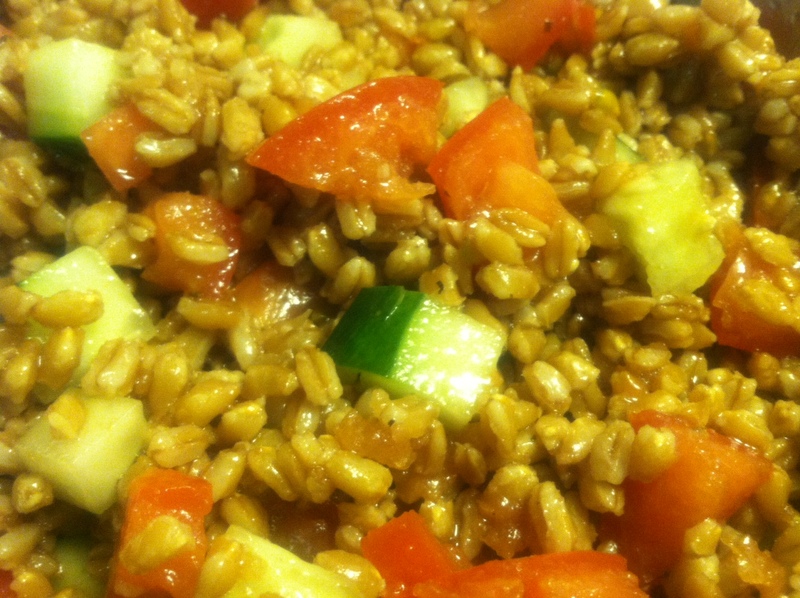 I toss the tomatoes into the farro but I place the cucumbers on top so they don’t soak in the dressing. I have tried using celery in the past but it is too peppery in flavor for this dish, so keep it light with the cucumbers. Also don’t overcomplicate it and add too much, it will lose its flavor and nuttiness. I then place it back in the fridge and let it marinate overnight or at least a few hours to settle. Then I bring it with me everywhere, keeping it cool, and serve with tortilla chips! 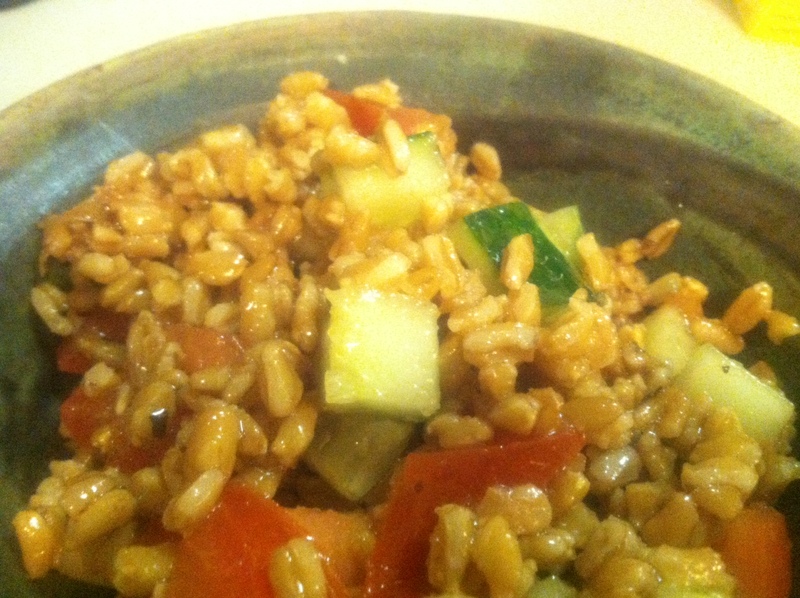 Add Farro, Water, and a pinch or two of salt to the steamer/rice maker and cook on brown rice setting. Check about 15minutes before it is scheduled to be finished as it may stick if overcooked. Place in a mixing bowl, cover, and place in refrigerator until cold. While farro is cooling, chop tomatoes and place in a small bowl. Set aside. Half peel cucumbers so that some green is still remaining, chop, place in a separate bowl. Set aside. When farro is cooled. Mix in dressing (*recipe below). Then mix in tomatoes. Place cucumbers on top but do not mix in until you are ready to serve. This will keep them from absorbing too much dressing. Place back in the fridge and cover. Let sit overnight or for at least 2 hours to combine and settle in the marinade. Serve cold with tortilla chips. The directions for this recipe are tricky and not exact. I start out with equal parts oil and vinegar and then go from there. Whisk Whisk Whisk! I find I add more vinegar in the end and I season to taste with the rest of the ingredients. I love garlic so I am generous with it. I add basil for aromatics and color but add it last and maybe about a tablespoon. The agave I whisk in to even out the vinegar. I start with half ACV and half Balsamic but it is a balsamic vinaigrette in the end so you want that flavor to come through. I tend to add a few spoons of water to thin it out and will even toss in dehydrated onions if it’s a mostly adult group. Mess around with it and see what happens. NOTE: Just be careful not to add too much to the salad I put it in and mix it at about 1/3 of a cup at a time until it is saturated well but not swimming. You don’t want any on the bottom that hasn’t absorbed. You can always bring more dressing with you if needed. It should be a fresh not soppy salad! OPTIONS: Add dehydrated onions to the dressing or top your salad with sliced avocado if serving in single servings!